Our kits feature hassle free bolt-in installation and are made specifically for these cars. Kits have everything you need to convert to power except for the steering column and ragjoint. All parts are also available separately. 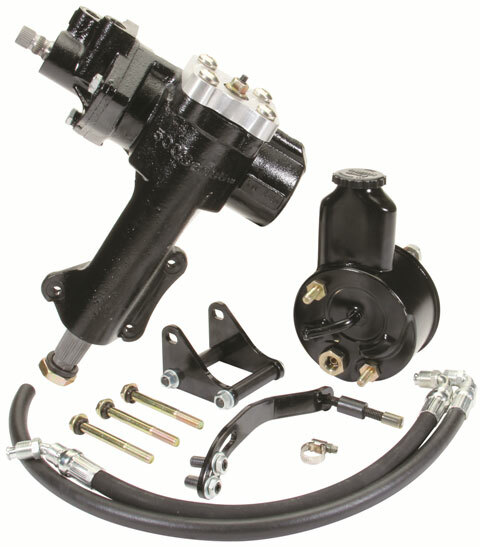 Kit includes CPP's 500 Series power steering box, power steering hose kit, power steering pump; part #5557PSK-S includes late model small block V8 power steering pump bracket with side mounts; part # 5557PSK-F includes early model small block V8 power steering pump brackets; part #5557PSK-FS late model small block V8 power steering pump brackets using front motor mounts. NOTE: Positive caster recommended when installing power steering. California seamless frame cars call for recommendations.